Cesare Ragazzi Laboratories is an established leader in the field of scientific research into hair and scalp disorders, and the development of effective treatments. Hair loss can be caused by trauma, pollution, genetics, diet, hormones, aging, medical treatments, disease can all contribute to the conditions, causing hair to weaken and fall out. There are many causes and many factors, but simply put, hair loss can be a deeply distressing experience. 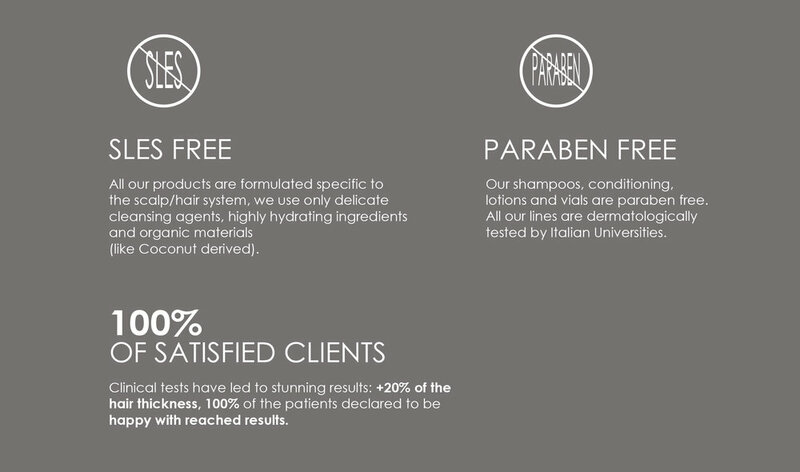 Cesare Ragazzi Laboratories offers unique, proven solutions to restoring hair and rebuilding confidence. Once treatment is completed, individuals can return to full styling treatments and high-impact sports. Just as each face is unique, each scalp and hairline is unique. Cesare Ragazzi Laboratories understands this. We have worked in high-technology environments for years developing the CNC® System, an advanced, non-invasive, dermatologically-tested, full or partial hair replacement system that restores beautiful hair - seamlessly. Soon after your treatment has commenced you can return to a full, active life including swimming and high-impact sports. HOW DOES THE CESARE RAGAZZI CNC® SYSTEM WORK? Phase 1: Scalp Mapping - Computer mapping of the sclap and alopecic area. Phase 2: Cast Production - A cast is created using specialist computer imaging, cloning the contours of the skull & scalp. Phase 3: Cloning and pantone matching - Clone membrane created by robotic technology, replicating exact shape, lines and pantones of your scalp. Phase 4: Hair Selection and Matching - Meticulous selection of high-grade human hair to replicate color and texture. Phase 5: Implanting - Hairs implated individually into membrane, mirroring original direction of growth. Phase 6: Non-Surgical Grafting - The membrane is non-surgically grafted onto the scalp before professionals complete a final styling. Phase 7: CNC® System Fully Integrated - Hair can now by exposed to all activities, including swimming and high impact sports. CRLAB embraces a formulative philosophy based on "Dermophytocosmesi," our products are made of high quality raw materials, which have undergone a refined productive process, in order to grant an excellent efficacy level. Our lotions - the result of an extremely accurate and efficient mix - are target oriented while never aggressive. Our cleansers do not contain harsh cleaning agents, which are normally the cause of dryness of scalp and follicles.